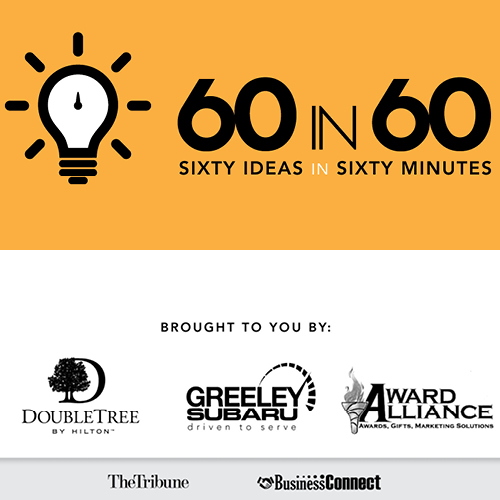 The Greeley Tribune invites you to 60 Ideas in 60 Minutes March 26, 2019. Come hear speakers educate and motivate you in your leadership roles. Be our guest at 60 ideas in 60 minutes and walk away with the collective knowledge of six forward thinking business leaders. While you enjoy a lovely sit-down breakfast, six leaders will share 10 of their company’s most successful programs and initiatives -- both big and small -- that can be applied to any business. Attendees will receive all 60 ideas in a special exclusive supplement, complete with areas to take notes. At the conclusion there will be time allotted for a panel Q&A with the six leaders. Speakers include a couple of past speakers that attendees were anxious to hear more from and new ones as well.